I don't know how other people feel about her. But I think she was a horrible person, a totally self absolved gold digger. And I can't help but feel her clothes reflect her personality. I like the clothes them selves, but when I know that they belong to Wallis Simpson I cringe. Her style was part of what got her a prince and in the process ruined the innocent lives of King George's family. Did she care?? Hell no! As long as she got what she wanted. I dislike the style of the queen mother, Wallis is not my favourite person but her fashion sense was worlds beyond. I always thought she looked like a man-woman. It's strange, but I feel sympathy for her. She was an awful person, but it would have been very big of the Queen or QM to show her mercy and make sure she was at least treated decently when she was so frail, she wasn't much worse that anyone in (or soon to be married in) to the royals. The Duchess should have stayed with her second husband and never left him for Edward. 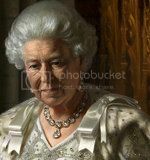 As for the Queen Mother, I admit that in the end, SOME decency should have been shown. It had been so different only a few years before. Ostracised by the Establishment after the Abdication in 1936, the Duke and Wallis Simpson lived out a golden life in America, France and the capitals of Europe. They sat at the centre of a gilded court-inexile, with a large entourage attending to their every whim. At either side of the large entrance gates, lampposts with ducal coronets on them were erected. The effect was that of a palace in miniature, filled with the accoutrements of Royalty, a place where two people who had scandalised the world held lavish dinners and parties attended by the rich and powerful. Ok.... This is going to sound harsh. (Because it is) But what happened to Wallis in the last few months of her life was really her own fault and she deserved it. How can I feel sorry for a woman like Wallis who was a Nazi sympathizer, marriage wrecker, gold digger, shallow “you can never be too rich or to thin” and just all a round horrible person who did nothing with her life apart from spend her husband’s money on clothes and jewels. BUT! I could forgive all of Wallis mistakes, all of them. If she had just shown some remorse for what she had done to the royal family, for being pro Nazi, if she had just thought about some one other than her self for once. But no. That was beyond her. It actually doesn’t surprise me that no one was their to up her in her last days. When you live the sort of life Wallis did you don’t have “real” friends you have staff and dinner guests. That's what I mean when I say she got what she deserved. If you live a shallow selfish life, and the time comes when you need someone to help you, that help won't come because you have done nothing to earn it. At least she left a huge wad to the Pasteur Institute, with which I worked and they do marvelous things. If she had just shown some remorse for what she had done to the royal family, for being pro Nazi, if she had just thought about some one other than her self for once. But no. That was beyond her. I remember that the Queen Mother was quite irate when she saw Wallis swanning around in luxury while people in BRitain starved during the war. Nice of her to be upset while the BRF was also breaking the rationing on food, clothing and essential supplies when guests weren't around to witness it. I think Wallace was what she was, a vapid, Nazi-sympathizing clotheshorse until the end, but personally, I think someone who never grows as a person or realizes what they've done wrong is a very sad and pathetic person worthy of pity. At least then, you come out as the bigger person. True, but Wallis on-uped her with her Nazi sympathizing. That's def. true. I don't even know if it's possible to make friends with anyone worse than the Nazis. Wallis and Edward were fawned over by the Nazis and she was even addressed as "HRH" by them; then of course the supposedly secret discussion to take over the Throne after the Nazis successfully invaded Britain and after the King and Queen were executed Wallis and Edward would be enthroned as puppet monarchs with Elizabeth and Margaret as heirs. I'm more than sure that things would have turned out more horrifically for HM had it been a success. Ok I can definitely see QM's feelings about Wallis and Edwards and I'm glad she never let up even in Wallis' final years. I think people like Wallis should suffer like that in order to evaluate their life and somehow make amends. It was a just penance. She destroyed the legitimate succession, she paraded around the world like a Pretender Queen Consort, and she humiliated her second husband while cavorting with Edward. Then of course, she was also supposedly cheating on Edward, while married to Edward so it's not like she was some maligned saint. Wallis also spoke out against the US helping Britain, branding us 'suckers' if in fact the US did come to the aid of the Allies. Got the karma she deserved.